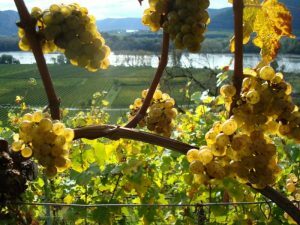 Explore the history of the Riesling grape, and get to know some fantastic Rieslings from Alsace and Austria. Sometime in the late 1300s in what is now Germany, a lowly, unloved grape known as Gouais Blanc met a mysterious stranger. Some years later, local farmers and winemakers began noticing an unfamiliar vine showing up in their fields and vineyards. This new variety was something of a problem child at the time, budding and ripening late, and producing wines with strange new aromas and flavors, but over the next 100 or so years the winemakers of the Rhine basin learned to love their new addition, embracing its aromatic qualities, cold-hardiness, and versatility. Variously dubbed “Ruessling,” “Roslink,” or “Rissling,” thanks to the haphazard approach to spelling at the time, Riesling remained relatively low-key in historical literature until the mid-1500s, when Hieronymus Bock published his popular illustrated plant encyclopedia, which included a detailed description of the grape. Bock’s work coincided with a larger awakening in the world of viticulture, in which wines were beginning to be categorized by their grape variety. Before the 16th century, wine in central Europe was produced and sold under two broad quality designations: “Heunisch,” (lesser), and “Fränkisch,” (greater), with little regard given to the grape variety. But the Renaissance-era spirit of knowledge and discovery was shining its light into all corners of human experience, and viticulture was no exception. Armed with this new insight into varietal wines, vintners were able to explore everything their little orphan grape had to offer. 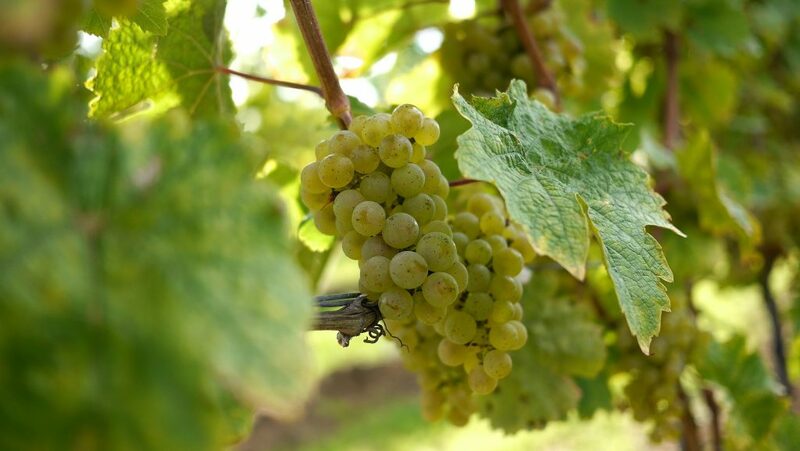 After 450 years of trial and error in the vineyard, experimentation in the cellar, and wild variations in vinification styles, Riesling has outgrown its humble beginnings to become a world-class variety, and the 7th most-planted white grape in the world. 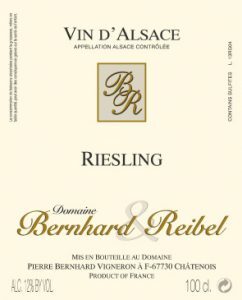 Riesling’s unique aromatic qualities, superbly structured acidity, and terroir-expressiveness have made it a favorite not only with sommeliers, but with chefs as well, as these qualities coalesce in a supremely versatile food wine. Despite all this, Riesling remains somewhat misunderstood in North America. Owing to the mid-20th century trend of white wine production that favored high levels of residual sugar, it is often dismissed as a sweet wine. From the 1940s through the late 1970s the majority of Riesling produced in Europe was notably sweet, as were many white wines of that time. But somewhere in the 1980s a shift began to take place, and what is now known as the Trockenwelle, or dry wave, began, and over the next 20 years winemakers began to increasingly tend toward a dry style of Riesling. While Europe and the rest of the world embraced the new dry Rieslings, the American notion of “sweet wine from Germany” hung on, and consequently wine lovers and foodies alike have been missing out. Two defining characteristics stand out as hallmarks of Riesling: relatively high acidity and intense aromatics. The former lends a bracing, lively palate to the wines, while the latter is a joy all its own. The balancing act between acid and sugar is a constant concern when trying to coax a wine from the Riesling berry. While high acidity does give the winemaker more leeway when working with fully ripe fruit, a cooler growing season, combined with the tendency to ripen late, can make for a thin, tart product, requiring extra care be taken during fermentation. Riesling’s aromatic qualities, second only to Muscat, are legendary. Described as anywhere from flowery and honeyed to spicy and steely, with the added complexity of its signature petroleum notes, the aromatic profile of Riesling stands out as one of its greatest strengths. Another notable quality of the Riesling vine is its sensitivity to minute variations in vineyard sites. Riesling’s uncanny ability to express soil composition, substrate chemistry, and climate have made it a favorite variety among a growing number of winemakers who prefer a terroir-driven style. These vintners favor minimal intervention with the grapes, focusing instead on allowing the fruit to tell the story of the soil where it was grown. 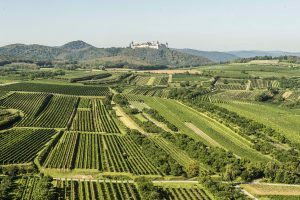 While there are superb examples all over the world of Riesling made according to this ethos, two examples stand out: Alsace in Eastern France and the Kremstal in Lower Austria. Each of these regions has a strong Riesling tradition, and both produce some of the best dry Riesling in the world. 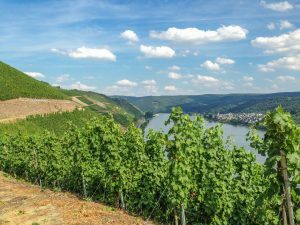 The Rhine basin, straddling the border between France and Germany, has long been acknowledged as the birthplace of Riesling. Situated along the western banks of the Rhine, Alsace lies in the northeast corner of France in the shadow of the Vosges Mountains. The interplay of the mountains and the river have blessed the region with a localized continental climate ideal for the cultivation of Riesling. The mountains’ profile is such that much of the western moisture from neighboring Lorraine is blocked, and the resulting rain shadow leaves Alsace with less rainfall than anywhere else in France. Alsatian geology is incredibly variable, ranging from limestone-riddled marl to sandstone to granitic gneiss, and everything in between. The extreme variation in soil and substrate composition gives Riesling an ideal venue to show off its expressiveness, with wines that show a flavor spectrum from citrusy acidity when grown in limestone soils to smooth and austere when grown in schist- or clay-rich soil. Of particular interest are the soils of central Alsace around the village of Châtenois, where one can find the granitic detritus of the erosion of the Vosges mountains mixed with deposits of limestone, mica, and gneiss, which have been exposed over the centuries by several geologic faults in the area. These soils have been hailed as some of the best for producing expressive, aromatic wines with intense minerality. 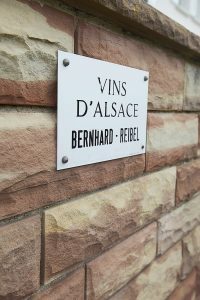 The quality of Rieslings from this area are evident in the offerings from Domaine Bernhard & Reibel, which has been producing exquisite wines in Alsace since 1981. The estate is, quite literally, a labor of love, having been founded soon after the marriage of Madame Cecile Reibel and Robert Bernhard, both coming from families with a deep history of Alsace viticulture. The pair soon realized that their true passion lay in winemaking, and they combined their respective vineyard holdings to great effect. They continue to produce many award-winning varieties, but with one-third of their vineyards under Riesling vines, it’s no secret where their allegiance lies. Vineyard: Granite, gravel. 30-40 year old vines, farmed organically. Vinification: Fermented in steel tanks with natural yeast; 12 months on the lees. Relatively new to the Austrian wine scene, Riesling was most likely imported in the late 1700s. For the next 150 or so years, area farmers experimented with the new vine, sporadically planting it to supplement their farming incomes. Up until the end of WWII, Riesling was largely ignored in the area, but after the war Austrian viticulture underwent a pronounced shift in practice, transitioning to more specialized and focused winemaking. Lower Austria, especially in the regions of the Weinviertel and Kremstal, proved to be ideal terroir for Riesling. While similar in latitude and elevation to the Rhine basin, Niederösterreich presented colder winters, greater precipitation, and loamy soils rich in limestone and alluvial loess. The hardy, adaptable vine took to the new conditions like the proverbial duck to water, and Austrian vintners now boast some of the world’s most celebrated dry Rieslings, with examples from the Kremstal earning accolades from wine critics and consumers the world over. One of the oldest wineries in the Kremstal, Stift Göttweig, sits in the shadow of the historic 11th-century Benedictine Abbey atop the Göttweiger Berg. Under the expert direction of Fritz Miesbauer since 2006, the winery has gained international acclaim for its dry, fruity, and slightly spicy Rieslings, grown primarily in the “Silberbichl” vineyard. The mica-flecked soils of the Silberbichl, mostly calcareous loess over ancient Danube gravel, combined with the intersection of Pannonian and Continental climates, provide a unique terroir for Riesling to express. Vineyard: Single vineyard “Silberbichl,” loess over sandy Danube gravel with mica and calcareous inclusions. Some years ago, I was asked to compile a music playlist based on the nature of wine varieties. It would be a sort of mixed-tape ode to wine. The idea was created by wine geeks for wine geeks (Wina-Con Alert!) and while it might seem ridiculous, thinking about songs that represent wine grapes is pretty fun. I’ve forgotten most of the songs I chose, but my choice for Riesling remains ever clear in my mind. Part of being in a wine circus means traveling for work so, one day, as my plane was landing at LAX, Lady Gaga’s pop anthem “Highway Unicorn” popped up on my de-stress play list and inspiration struck. If you spend anytime on social media you have seen mention of “unicorn” wines. These are wines that are unbelievably great, so fantastic and/or rare that they bear comparison to the spiritually grand, mythological, unicorn. I started thinking about the centuries long journey of Riesling, its ability (in caring hands) to translate terroir, and the multitude of awe-inspiring Riesling wines I’ve had in my time as a wine lover. I recalled the Riesling Rendezvous conferences I’ve attended and the numerous, glorious Summer of Riesling events championed by Paul Greico and his disciples over the last decade. I decided, while listening to Mother Monster, that even if I couldn’t bring myself to believe in unicorns, that I did believe in the noble Highway Unicorn that is Riesling. Last summer, I was able to share my love of Riesling by collaborating with author, John Haeger, in producing a seminar series based on his book about Dry Riesling, Riesling Rediscovered . Along with winemaker, Emmerich Knoll III and Master of Wine, Andreas Wickoff, we explored the singular terroir of vineyards located in the south side of the Danube between the Wachau and Kremstal regions of Austria. It was gratifying and a bit surprising to see packed seminar rooms full of wine cognoscenti who were all engaged in tasting and learning about these specific expressions of Riesling. All of this excitement aside, we in the wine trade know that Riesling is still difficult to sell and is considered a niche grape, “hand sell” sort of wine. There have been, unfortunately, some poor but widely distributed expressions of this variety that etched a simple and sweet persona for the grape. Much like “Ice Ice Baby,” its been difficult for the American public to get this flavor of Riesling off the mind’s eye of their palates. If you’ve read this far, you are probably already part of the Riesling choir. In case you just got hooked, however, I would say that the quest for Riesling is worthwhile. Try some of ours or love the one you’re with by trying a Riesling at your local wine bar. It might not be a unicorn but it may be magically delicious!